When Solano County 4-H’ers compete in their annual Chili Cookoff, part of the countywide Project Skills Day, the competition is as fierce as some of the hot peppers. This year’s cookoff was no different. When it was all over but the tasting, the “Beanless Babes Do Beans,” a duo from the Maine Prairie 4-H Club, Dixon, won the championship, followed by “The Golden Spice Girls,” a trio from the Tremont 4-H Club, Dixon. Judges proclaimed both dishes as delicious, but especially the Beanless Babes' dish made by Lauren Kett and Rebecca Ivanusich. “It was really good,” said judge Jim Baumann, owner of The Point Restaurant, Rio Vista. Fellow judges Trish San Nicolas of the Golden Hills 4-H Club, Vacaville, and Jose Topete of the U.S. Coast Guard, based in Rio Vista, agreed. They said they were impressed with the taste, creativity and presentation. 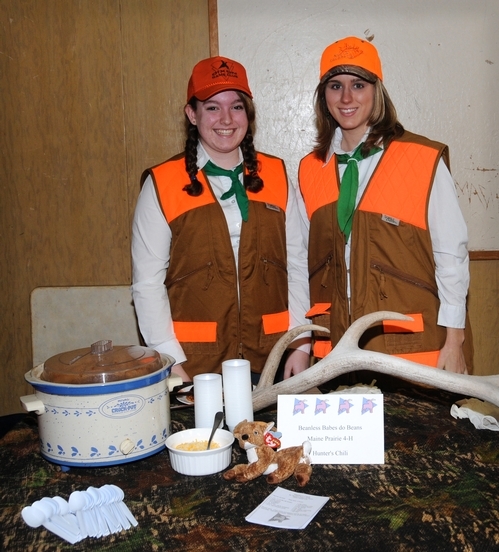 The recipe was based on a recipe published by the North American Hunting Club. “This was the first time we made it,” said Rebecca. Lauren's father provided the elk burger. The second-place chili, made by Kaylee Lindgren, Savannah Woodruff and Hannah Crawford-Steward, also drew praise from the judges. "Wonderful!" said San Nicolas. Eight teams from 4-H clubs throughout the county competed in the Solano County 4-H Chili Cookoff, held earlier this year in Riverview School, Rio Vista. Also participating were six other teams: the Three Amigos from the Rio Vista 4-H Club; Red Hot Chili Peppers from Sherwood Forest 4-H Club, Vallejo; Suisun Valley Cowboys from the Suisun Valley 4-H Club, Fairfield-Suisun; 4-H Iron Chefs from Tremont 4-H Club, Dixon; and the Chili Chicks and Firecrackers, two teams from the Vaca Valley 4-H Club, Vacaville. Here are the winning recipes. Add more hot peppers for "more kick"; adjust to preferred taste. Brown meat. Chop onion and peppers and fry in butter until limp. Add all ingredients. Simmer for at least two hours. Serves several hungry persons. In a large pot, cook onions, garlic and meat until brown. Add beer and stir over medium heat for 3 minutes. Add espresso, brown sugar and tomato paste. Stir in cocoa, soup mix and spices. Stir in one can of kidney beans, tomatoes and green chilies. Reduce heat and simmer for 1-1/2 hours, stir occasionally. Add flavored coffee and one can of kidney beans. Reduce heat and simmer for 1/2 hour, stir occasionally. Optional toppings: fried onions and sour cream. Serves 6 to 8. The Solano County 4-H Youth Development Program is headquartered at 501 Texas St., Fairfield.